Since I serve Lebanese rice with nearly everything, it’s only fitting to add a Lebanese rice recipe here. This is a simple vegan rice pilaf made of three ingredients: vermicelli pasta, rice and olive oil. 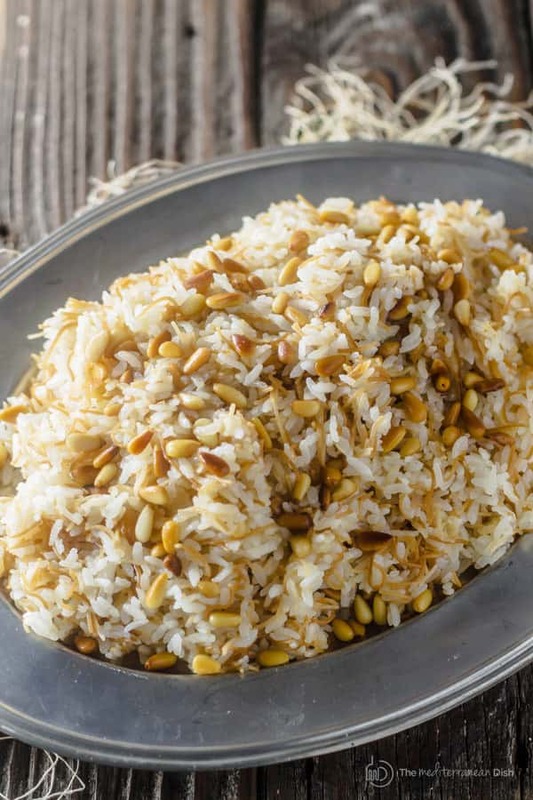 Add a bit of toasted pine nuts, and you have the best side of rice! Check out the video and step-by-step tutorial. Throughout the Mediterranean, you will find rice dishes like, Paella; Mujadra (lentils and rice); or Hashweh (Beef and rice), that are certainly more of a meal. 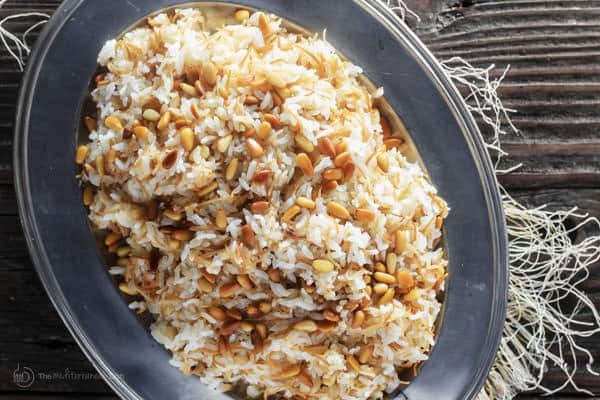 But this Lebanese rice with vermicelli is the every-day rice of the Middle East, and it’s by far the most served side dish in that part of the world. Basic Lebanese rice typically consists of broken vermicelli pasta, rice (medium or long grain rice works), and extra virgin olive oil or butter (or a combination of both). I use only extra virgin olive oil here. There is but a pinch of salt to season this rice. 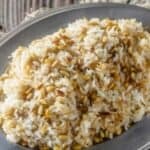 And to jazz things up, I like topping the rice with toasted pine nuts adds a nice nutty flavor and texture. 1- You must rinse the rice to get rid of excess starch which causes rice to be sticky (Lebanese rice is not meant to be sticky). Then soak the rice for 2o minutes or until you can break one grain of rice by pressing it between your index finger and your thumb. This way, you shorten the cooking time making sure the interior of the grain actually cooks before the exterior looses its shape. Remember that the rice to use here should not be partially cooked rice. 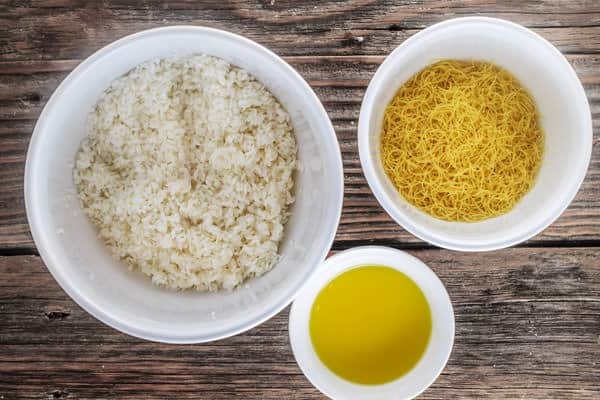 2- To give the Lebanese rice flavor right from the start, toast the vermicelli in olive oil until golden brown (as you’ll see in the step-by-step below), then add the rice and toast so that each rice grain is coated with the olive oil. 3- Once the rice is fully cooked, let it rest for 10-15 minutes or so, then fluff it with a fork. This again helps keep it from becoming sticky or gluey. Vegan Lebanese rice with vermicelli and pine nuts. 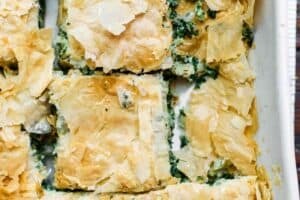 A great side dish next to many Mediterranean favorites. In a medium non-stick cooking pot, heat the olive oil on medium-high. Add the vermicelli and continuously stir to toast it evenly. 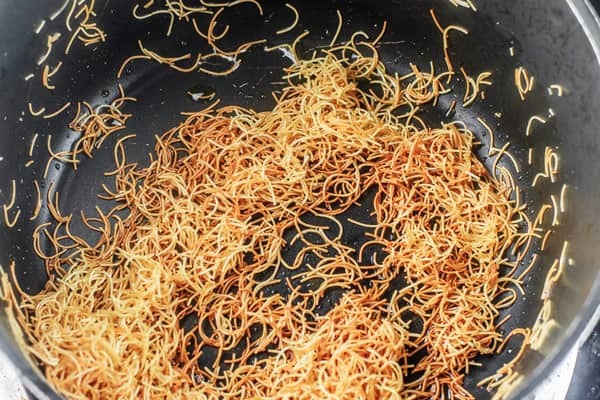 Vermicelli should turn a nice golden brown, but watch carefully not to over-brown or burn it (If it burns, you must throw the vermicelli away and start over). Now add 3 1/2 cups of water and bring it to a boil until the water significantly reduces (see the photo below).Turn the heat to low and cover. Cook for 15-20 minutes on low. Once fully cooked, turn the heat off and leave the rice undisturbed in it’s cooking pot for 10-15 minutes, then uncover and fluff with a fork. Pro Tips: 1. You must rinse the rice to get rid of excess starch which causes rice to be sticky (Lebanese rice is not meant to be sticky). Then soak the rice in plenty of water for 15-20 minutes or until you can break one grain of rice by pressing it between your index finger and your thumb. 2.toasting the vermicelli in EVOO as a first step is what gives this rice great flavor. Do not skip this step. 3. If you can at all help it, let the rice rest for 5 to 10 minutes before serving. Rinse the rice well then place it in a medium bowl and cover with water. Soak for 20 minutes. Test to see if you can easily break a grain of rice by simply placing it between your thumb and index finger. Drain well. Add the rice and salt and continue to stir so that the rice will be well-coated with the olive oil. Now add 3 1/2 cups of water and bring it to a boil until the water significantly reduces (see the photo below).Turn the heat to low and cover. Hi Suzy! I am very happy to find this site! I want to know, is it possible to make this rice with brown rice? And if so, what changes should I make to ensure the rice is fully cooked? Hi Sheila. Traditionally, this recipe is done with white rice. But I know you can make it with brown rice. Remember though that brown rice does take more liquid and more time to cook. You will need to soak it for a bit still before using, then, I would say, follow your brown rice package to determine liquid amount and cooking time. That’s my best guess here. I am thinking of making this for a large party (25-30 people). Can it be quadrupled? Also, can it be made ahead of time? Thanks! Thank you. 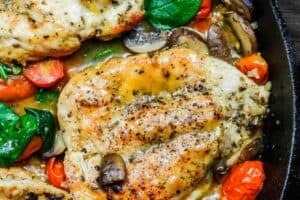 Can I make the dish the day before I serve it? My pleasure! Yes, you can make it ahead. Once it cools, store it in a tight-lid glass container in the fridge. Warm over medium heat, tossing occasionally (you may add a little tiny bit of water and break up the rice with a wooden spoon). Used the short grain rice on hand. Rinsed it twice. Turned out delicious as well as pretty. Thank you for the recipe. Wonderful, Donna! Glad you enjoyed it. I would be sure to wash the rice real well until the water runs clear and then soak it until you are easily able to break a piece of rice. I use rendered butter to brown vermicelli and use chicken broth instead of water. Thanks for sharing your version, Joanne! Delicious. Husband and son really enjoyed. I always try to avoid cooking rice, since I never get to to it right. Either they are too mushy or still hard on the inside…Not giving up yet though. I love the Arabic rise dish, who would think vermicelli would make such a big difference!! 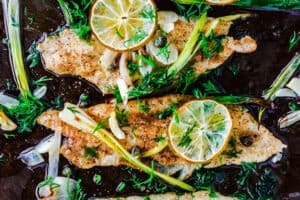 Here comes my question: Can I use basmati rice for this recipe? Hi Linnea. Basmati rice cooks far differently. Vermicelli does make a difference in adding a certain taste and texture to this rice (it’s more of a pilaf.) Hope this helps. 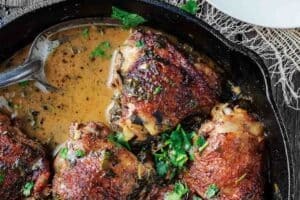 Would this work with short grain rice as well? Hi…..love the rice, do you have any vegan recipes? Awwww! So glad to hear this, Sylvia. Thank you so much for sharing! 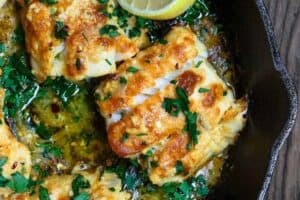 I just recently came across your site and recipes! I am so excited to try many of them….THANK YOU for sharing them with us. Today I made the Lebanese Rice with Vermicelli to go along with the Skillet Garlic Dijon Chicken. OH MY…They were both so delicious! I so love the rice and how it does not stick. I ordered some spices from you and cannot wait to get them so I can try more of your recipes. Again, thank you for sharing and teaching about Mediterranean cooking. Thank you! So glad to have you here. 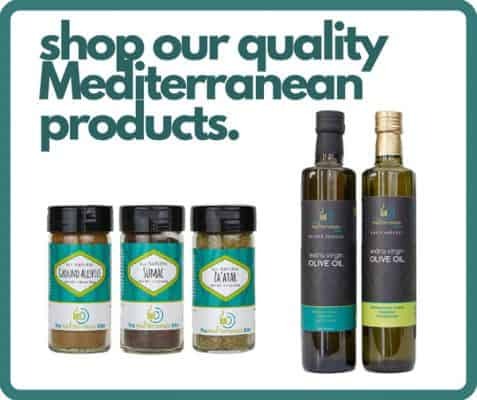 Welcome to The Mediterranean Dish community. Can’t wait to hear what you cook next! This is the best rice I have ever made. After 33 years of cooking I am amazed. It was so good and fluffy. I can’t believe just soaking it does that! I cooked the pasta in the skillet but transferred it to a rice cooker and added the rice to the cooker, mixing it with the pasta to coat the rice with oil. It came out perfectly. I topped it with roasted almonds. Thank you! I am excited to hear this, Barbara! Thanks for sharing your adaptation! Hi! 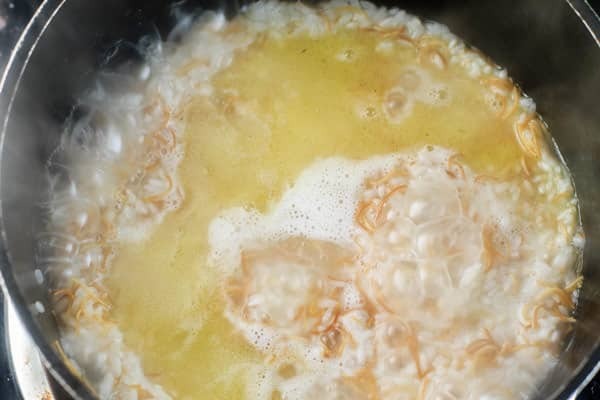 When you cooked this in the rice cooker, did you still add 3.5C water? Please let me know, that is how I want to cook this. Thank you! Thank you, Maureen! Glad to have you here!